It is all over the news. 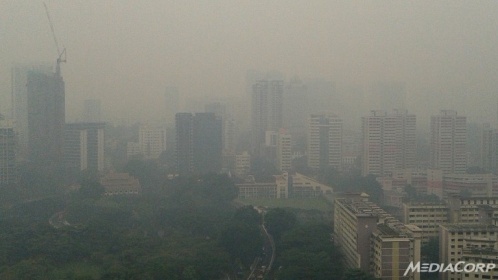 According to Strait Times, “Singapore endured its worst day of haze yesterday, June 19 2013, as air quality surged into hazardous territory for the first time, prompting government agencies to reach for contingency measures.” Experts advise children and elderly, especially those who have respiratory or heart diseases, to stay indoors to prevent the effects of haze. 1. Cover your nose and mouth with a mask when you go out – make sure you get a mask that can catch tiny particles below 0.3 microns. 2. Keep the doors and windows of your home closed. 3. Roll up the windows of your car if you are driving. 4. Use an air-conditioner in your home to help remove pollutants. 5. Use an air ionizer or air purifier to catch very small particles. 6. Drink more water than usual – this helps the kidneys flush out any toxins absorbed through the skin and lungs. 7. Cut down on coffee and alcohol – these promote fluid loss and leach nutrients from the body. 8. Build up your immunity with foods rich in vitamin C (oranges, guava, strawberries), vitamin E (nuts and seeds) and omega-3 fatty acids (oily fish). So, Mummies and Daddies, keep well. We, from MummySG, hope that sooner, the haze will be gone. Recently, we are using it for our home and car. it’s affordable too ($25 only for room, and $20 for car). The smell is tea tree oil, my kids and parents like it so much. The products said that the main functions are to kill germs, bacterias, fungus, odour, etc. My little girl has problem with her breathing (sinus), I purchased 1 and place it in her room. It works, and when she wakes up in the morning, she is a bit better. Then, 1 night I drove my parents to buy durians, and put it in my car. Then the next day morning, I went to office, the smell in my car was gone. I heard from few of my friends, that MOE schools also using it, childcare.